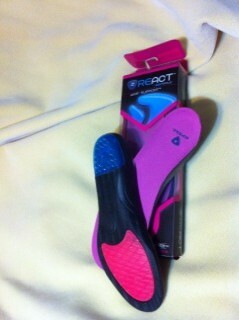 This summer, my husband and I had the opportunity to try React insoles, produced by Sof Sole. There are two types, one with arch support and one without. Both give more cushioning to athletic shoes “using the most widely recognized and advanced performance enhancing cushioning technologies.” Both provide “superior shock absorption, gel forefoot cushioning and the energy rebound foam reduces impact forces.” The former, The Airr Support, also has a TPE Stability Plate to reduce pronation. Both Dave and I expected that we would have to trim the insoles to fit our shoes properly but, unlike other insoles or orthotics that we have used, they fit our shoes perfectly. I even took my insoles (women’s 7-8) and put them in my son’s size 7 men’s shoes and, again, found that the fit was great and no trimming was needed. I have a few friends who have had to replace either insoles or orthotics after snipping them the wrong way, something that doesn’t seem to be an issue with React insoles. While I initially felt that the insoles were taking up a lot of space in my shoes, my feet never felt tight, nor did I feel that the heel was slipping. The React Airr insoles were more than efficient at properly keeping my feet in my shoes. Both the React Airr Support insoles and the React Airr Active have a great deal of cushioning. Dave felt that he needed a firmer instep for tennis and running so he replaced his orthotics with the Airr Support insoles. These were excellent as they immediately provided both the extra cushioning and arch support needed. After wearing them for a few weeks, Dave ended up preferring these to his heavier and firm orthotics. We both wish that we had found these sooner because we would have saved a lot of money in orthotic bills. I have been wearing the React Airr Active insoles in my day to day shoes all summer and have loved the extra cushioning that they provide. They’ll be great when I’m back at school in a few weeks and am on my feet all day. After six weeks, Dave and I are impressed with the technology of React insoles by Sof Sole. We have had them on our feet day after day, but the insoles are still showing little sign of wear. This is a product that seems to last. Both of us are quite happy with the product and give it high scores for comfort (8.5/10), support (8/10) and value (9.5/10). For anyone who needs something extra in their shoes but doesn’t want to spent a lot of money, we highly recommend React insoles, by Sof Sole. The ideas and opinions in this review are entirely Dave’s and my own. We were not paid for our opinions by Sof Sole. I may buy a pair thanks!